core+measures/latest+core+measure+news.htm to respond to the proposed measures via an online survey. Two of the proposed measures deal with patient education. If you agree that all VTE patients should know about ClotCare so that they can learn about their condition and treatment and get answers to their questions, please tell JCAHO about www.clotcare.com in the comments section of each survey question regarding patient education. 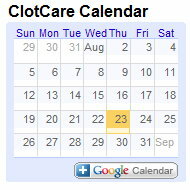 ClotCare is a member organization of the Coalition to Prevent Deep-Vein Thrombosis. The Coalition to Prevent DVT has been instrumental in driving NQF's interest in improved diagnosis and treatment of DVT. Your participation in this survey is a crucial step in establishing a standardized set of inpatient measures of appropriate DVT care. Survey responses must be received before February 18, 2006 at 12:01 AM. Following analysis of all public comments, a Technical Advisory Panel will recommend which measures will move forward for testing.